These General Rental Terms & Conditions (hereinafter referred to as the "General Conditions") apply to all rental agreements concluded with us. Terms and Conditions of the lessee which are contrary to or deviate from these General Conditions shall only apply if these have explicitly been acknowledged by us. General terms and conditions of the lessee are also non-binding, if their validity is not explicitly contradicted. A tacit acceptance of the lessee's general terms of business by means of conclusive behaviour is excluded. Unless otherwise agreed, the rental rates apply from the renter’s warehouse. The rent is calculated at the end of the month. Partial months above the minimum rental period are settled aliquot by the day. All invoices issued for rent administration for processing/waste or losses/freight costs/purchase of the rented object are due for payment within 14 days of the invoice date, net without any deduction. The actual delivered profiles and lengths will be charged for the value of waste, total loss or purchase from rent. There is no rental deduction for waste, for total losses or purchase from rent, there is a rental deduction in the amount of 60% of the debited rents, plus 8% interest p.a. In the case of a purchase of the rented object by the lessee, ownership of the rented object is transferred to the lessee only after the redemption of all claims from the rental contract and the complete payment of the purchase price (retention of title). In the case of a delay in payment, the lessee is obliged to pay interest on arrears at the rate of 5% above the base rate of the European Central Bank. This shall not affect the claim of further damages due to delay. Failure to comply with our terms of payment as well as circumstances which jeopardize the Buyer's creditworthiness will promptly make all our claims due without regard for possible deferred payment. Unless otherwise agreed, the lessee has to pick up the rental object at his own cost from our warehouse. All transports have to be coordinated in a timely manner, at least 3 working days before pick-up, directly with our warehouse. We do not take any liability for idle or loading periods. The rental object will only be handed over after acceptance and delivery of the signed rental agreement by the lessee. 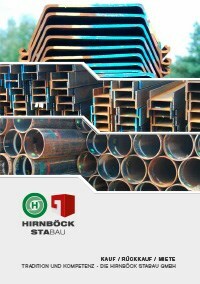 Unless explicitly agreed on the delivery of new steel profiles, also used parts can be delivered. The rental period generally starts with the day of provisioning of the rental object at our warehouse. In case we deliver, the rent starts with arrival of the rental object at the place of use. A month of rent is generally calculated on a 30 day basis. The rental period ends on the day the rental object is delivered back to our warehouse by the lessee in the condition stated in the contract. If the rental contract has been concluded for a fixed period, it cannot be terminated before the expiry of the rent. Our right to extraordinary termination according to the provisions of clause 11 is reserved to us. There will be no reimbursement of the rent if the material is returned early. The lessee is obliged to adequately insure the rental object for the time from pick-up until its return against damage, loss and destruction. On request, the lessee has to prove this insurance to us. Changes to the rental object or handing it over to third parties, no matter in which way, are forbidden without our prior written consent. The usage of the rental object at another place as the agreed upon place of use or construction project is forbidden without our prior written consent. Should the lessee fail to comply with this obligation, he is obliged to pay a minimum concession penalty, which is not subject to judicial mitigation, per infringement, amounting to the double agreed minimum rent. The lessee has to use the rented object in a careful manner, to treat it with care and to protect it from overstressing and damage of any kind. The lessee has to pay the contractually agreed loss price due to use or overstress of the rental object for caused loss of material or damage. We have the right to inspect the rental object at the place of use at any time and check its proper condition. The transfer of risks for the lessee only ends after the proper return of the rental object at our warehouse. In case of destruction, loss, damage or theft of the rental object, the lessee shall compensate us for the damage caused by replacing the loss of material in the amount of the agreed loss price or, should this not be agreed, in the amount of the actual original price. The lessee's obligation to pay the agreed rent is not affected. In case the lessee rents objects of the same or similar kind which are used on the same construction site, the lessee is obliged to mark the objects rented from us without damaging them. In case the lessee fails to comply with this obligation he has to pay damages. We provide warranty only for properties explicitly agreed in writing, otherwise we do not give any warranty for material defects, in this respect also compensation for damages and avoidance due to error are excluded. The obligation to reprimand is agreed for all defects and damages in accordance with §377 Commercial Law (HGB), whereby any reprimand has to be done in writing. The reprimand of defects does not entitle the lessee to withhold payment of invoice amounts. Defective rental items will be improved or exchanged at our decision within a reasonable period, provided that a warranty obligation by us exists; a rent reduction or conversion/withdrawal from the contract by the lessee are excluded. Any liability by us, insofar a liability exists at all, is limited to gross negligence or deliberate damage and, moreover, limited to the value of the rental object. Any claims by the lessee for compensation for lost profits are excluded as such. The lessee is obliged to notify us without delay of any official, judicial or other measures of third parties (seizures, confiscation, etc.) concerning the rental object owned by us and to inform the third party of our property. The lessee shall bear all cost of judicial and extra-judicial measures and interventions which are carried out to prevent or eliminate the procedure. The lessee is obliged to return the rental object after the end of the rental period stated in the rental contract to our warehouse at his own expense. All transports have to be coordinated in a timely manner, at least 3 working days before drop off, directly with our warehouse. The rental object has to be kept in the same condition as it is, also cleaned and returned in a fully functional condition by the lessee. Sheet pile interlocks must be clean. Hooked profile ends have to be trimmed in an according angle. Anchor holes and other holes (max. size 200mm x 200mm) apart from a drawing hole 40/300 mm per single sheet are to be welded tight in a professional manner. All profiles must be free from adhesion and corner profiles. The maximum deviation of the straightness is +/- 0.2% of the profile length. The deviation of the profile width for single sheets is restricted to +/- 2% and for double sheets to +/- 3% of the respective width. The lessee must carry out all necessary repairs, which are necessary due to the use of the rented object, at his expense. We are entitled to refuse the return of non-cleaned or non-fully functional rental objects items by the lessee until the proper condition has been established. Upon return of the rented item, these will be examined for damages and recorded by us. The records will be communicated to the lessee. If defects are found, these will be remedied by us and the costs will be billed to the lessee according to the conditions stated in the rental contract. If a repair of the rental object is not possible or is economically not justifiable, the lessee must replace the loss of material to the amount of the contractually agreed loss price or, if this is not agreed, to the amount of the actual original price. If shorter steel pile sheets are rented, the length at return must not be more than 10% shorter than the length at delivery. If shorter profiles are rented, the length at return must not be more than 10% shorter than the length at delivery. The steel beams may be shortened up to 10% of their delivery length. Profile lengths are given in increments of 0.50 m. The permissible longitudinal tolerance is +/- 0.25 m.
Rental objects which do not correspond to the minimum length for return before or after treatment will be billed as a total loss. These will be kept in our warehouse 1 month after settlement for pick-up by the customer. In case these total losses are not collected by the lessee within this period, they will be disposed of without compensation for the lessee. We are entitled to terminate the rental contract prematurely if the lessee falls into arrears with a payment due in full or in part, makes a disadvantageous use of the rented property or violates any other provision of the contract. In this case we shall have the right to secure the rental object and remove it. The cost for this, including salvage costs, freight and loading costs, shall be borne by the lessee. We may also terminate the contract without notice if the lessee's financial situation deteriorates in such a way that the payment of the rents and costs is no longer secured or has become or will become a settlement or bankruptcy procedure over the lessee's assets as well as when insolvency proceeding is omitted because of lack of cost-covering assets. The right to terminate the contract without notice for good cause shall remain unaffected. If the contract is terminated without notice for one of the above reasons, we can settle our loss without any further proof with a penalty, which is not subject to judicial mitigation, amounting to the double of the agreed minimum rent. We explicitly reserve the right to assert further claims for damages. Austrian law always applies for all business relations with us. For all the rights and obligations resulting from the rental transactions with us, the place of fulfilment is Salzburg, Austria. Jurisdiction for legal disputes for all present and future claims arising from the business relationship is Salzburg. Without prejudice to this, we are also entitled to appeal to another court responsible for the lessee. Should individual provisions of these rental terms and conditions be or become invalid in whole or in part, the remaining conditions shall remain fully effective. In the event of ineffective provisions, then, those which reach their purpose in the most appropriate manner will then take the place. Deviating agreements or supplements to the General Rental Terms & Conditions require the written form to be valid. Verbal side agreements are not valid. We are entitled to transfer our rights under this agreement, either individually or in whole, to third parties without the lessee's consent.